I’m slowly learning how to make more condiments from scratch, but something about homemade mayo has always daunted me. I tackled homemade ketchup last summer when we had tomatoes coming out of our ears, and that was relatively easy. I’ve made carrot top pesto too, which was also easy, but there’s nothing like conquering the most difficult condiment in the collection, right? As it turns out, all those myths about homemade mayo were wrong! With one amazingly simple recipe (and a couple tricks), you’ll have delicious homemade mayo ready in less than 2 minutes! In a wide-mouth jar, layer your ingredients as follows. First, the lemon juice. I prefer the taste of freshly squeezed, but you can use bottled if you prefer. Second, add the egg. Yep, the whole thing. Crack it in there straight from the fridge (or where ever you keep eggs.) There’s no need to warm, thaw or allow to come to room temperature. Third, add the salt. I used kosher salt, but table salt is fine too. If you use table salt, reduce the quantity to 1/2 for now. You can adjust this to taste later. Finally, add the light olive oil. Do NOT use extra virgin olive oil. Extra virgin olive oil is absolutely delicious in dressings or with freshly baked artisan bread, but it does NOT taste good in homemade mayo (been there, done that). You need a healthy oil that’s light in flavor, so light olive oil is great, as is avocado oil, sunflower (not safflower), sesame oil and even expeller pressed coconut oil (not extra virgin). If you’re REALLY feeling fancy, you can also use walnut oil, macadamia oil, bacon grease and ghee (but not all individually, nor all together). Note: I have not tried numerous combinations of all the oils listed above. I tried 50/50 extra virgin olive oil and avocado oil, which didn’t taste very good at all. I’ve also tried light olive oil as the recipe is written, and since it produced an amazing mayo that tasted better than any store-bought I’ve ever had, I stopped there. Feel free to branch out and experiment, and if you do, please leave a comment sharing with us what worked and what didn’t! Basically, just follow the recipe folks. Before you do anything else, wait until the egg is at the bottom of the jar and the oils is sitting at the top of the jar. 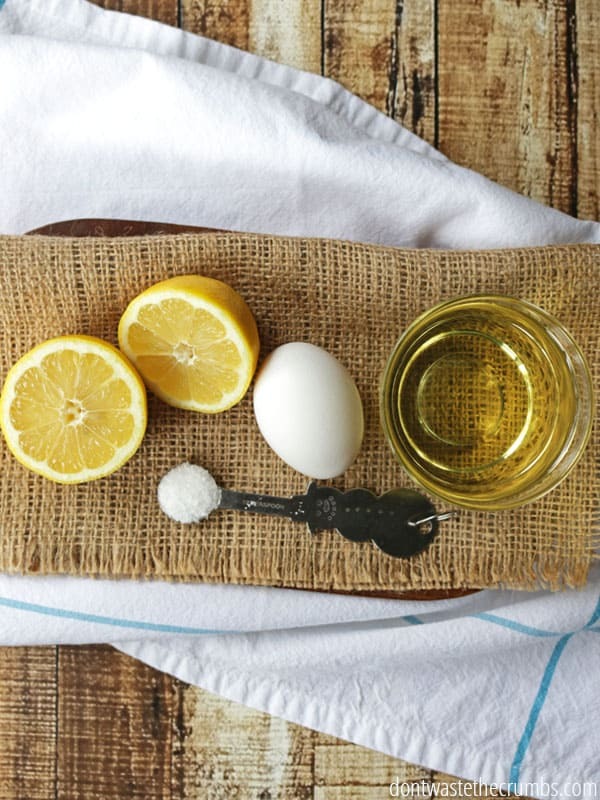 If you’ve followed the tutorial so far and added everything in the right order, this won’t take very long… maybe long enough for you to throw the egg shell in the garden, put the oil and salt away and add the lemon peels to your jar of citrus vinegar. When time is up (or when you’re done cleaning), get out your immersion blender and stick it in all the way to the bottom. With the immersion blender at the bottom of the jar, press the button to “go” and let it blend for 20 seconds while sitting at the bottom of the jar. After 5 seconds, you’ll have mayo at the bottom. At the 10-15 second mark, you’ll notice the mayo creeping to the top. At about 20 seconds, you’ll have mayo near the top of the ingredients with a very thin layer of oil right on top. Keep bringing your immersion blender almost to the top, stopping just short so you don’t splatter mayo everywhere. Your mayo is done when all the ingredients are incorporated together! If you are using whey, finish the recipe as directed, then add whey and stir in well. Let sit on the counter at room temperature for 24 hours. Then refrigerate. (1) The oil must be separate from the egg. Most homemade mayo recipes have you slowly drizzling in the olive oil. That’s to give the emulsifying agent a chance to get in between the water (lemon juice) and oil. If you just dump it all in together with no rhyme or reason, you’re setting yourself up for a fail. Always add the water (lemon juice) first, then the emulsifying agent (in our case, the egg), then all the seasonings/flavors and finally the oil last. Letting it all sit for a minute gives the ingredients a chance to settle from all the ingredients additions. (2) There must be enough of an emulsifying agent. 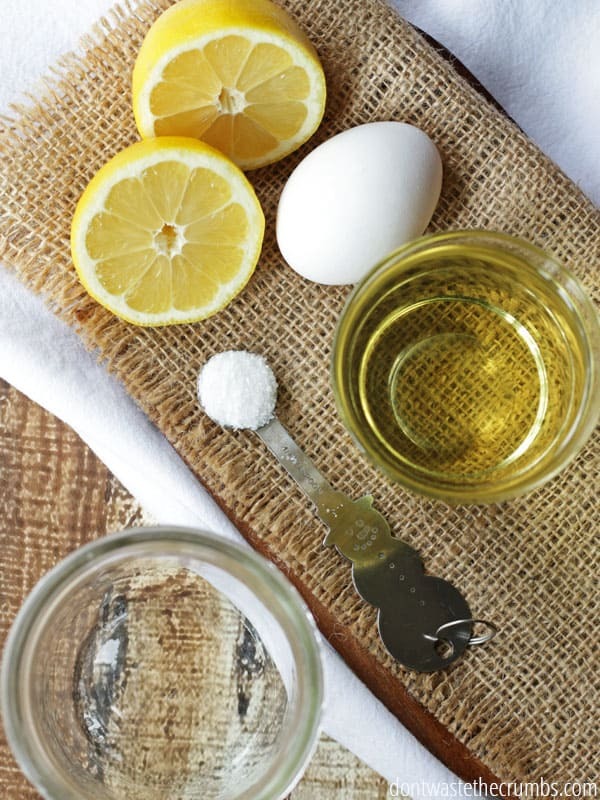 Egg is an emulsifying agent, as is lemon juice, vinegar and mustard. You must have enough of an emulsifying agent in ratio to the oil for the mayo to turn out correctly. One egg is approximately 3 tablespoons, and you’ll need more a complete no-fail mayo recipe. 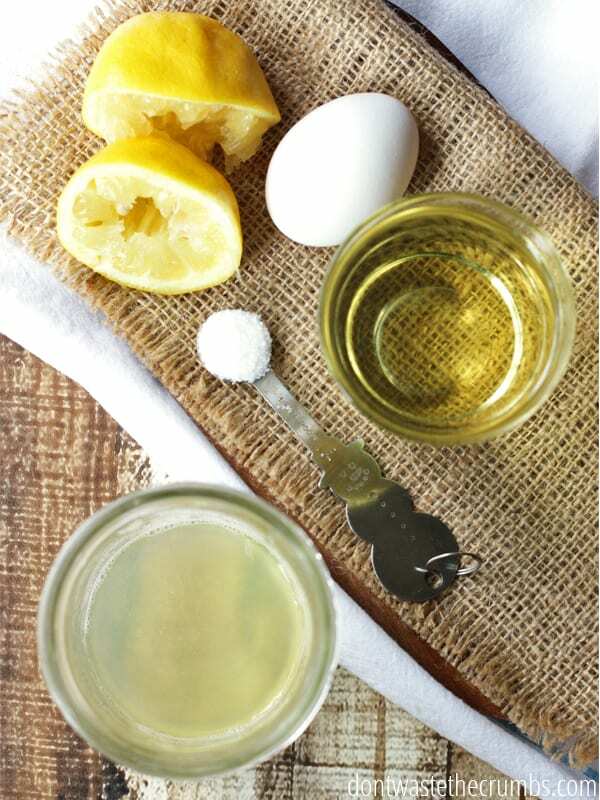 My recipe uses lemon juice and when combined with the egg, it’s the perfect ratio for 1 cup of oil. Other recipes call for up to 1 tsp of mustard and reduce the level of acid. Some recipes use 2 eggs. It really depends on your preference, but know that the more oil you use, the greater portion of emulsifier you’ll need. As is, homemade mayo is good in the fridge for about one week. However, by lacto-fermenting the mayo you can make it last for several months. To do this, add 1 tablespoon of whey to the finished mayo and stir well. Allow mayo to sit on the counter overnight, or up to 24 hours. Put the mayo in the fridge and you’ve got mayo that will be good for 2 months, or more! 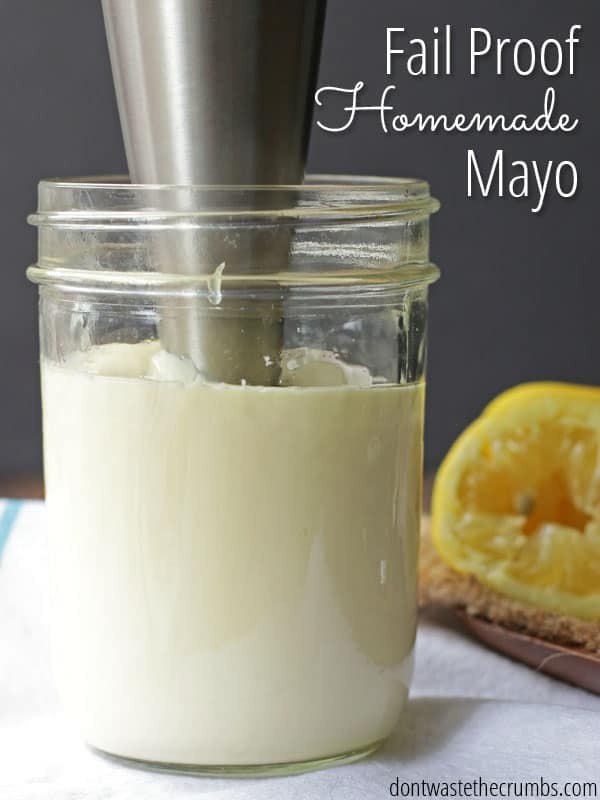 It’s a good thing mayo is so easy to make – it’s my favorite condiment! What’s yours? I add the ingredients “the other way around”: (garlic), egg, oil, vinegar and salt. IT always works. I don’t think I give it time to separate, or at least not consciously, but keeping the blender down until most of it has emulsified is, for me, the key to success! Over here it is quite common for people to do their own mayo. Wow, thanks for your tip Xenia! I’ve read many a horror stories that it not working out without the separation, but I’m happy to hear it works for you! Hi Denise! I use the whey that you find on top of yogurt. I just tried this method and it came out FANTASTIC! I tweaked the recipe a bit by using 3 yolks from my backyard chickens and ACV instead of lemon juice. I also used EVOO, as I like the robust flavor. Definitely a keeper and no more nasty soybean oil for me! Add mine to the horror stories…so many expensive ingredients totally wasted. I had sworn off homemade mayo for good until reading this and wondering if I just had the mixing method wrong? Thanks for the step by step tutorial and extra tips – maybe I should give it one final go! Dena I hope you give this recipe a try. I had many flops and had given up on ever making mayo on my own until I found this recipe. I have made this recipe at least 5 times now without ANY flops. Before finding this recipe I had made mayo with some success and some flops. The flops are SO frustrating! This is a keeper recipe for me and I hope it is a winner for you too. The key is definitely to keep the immersion blender in the bottom of the jar until the mayo is very thick and then VERY SLOWLY bring the immersion blender up to finish mixing in the oil. I am thankful I found this recipe and hope it works for you too! Aw, thanks for the encouragement Janette!! I’ve read a few recipes for homemade mayo and they all say the egg must be from a pastured chicken. Is it really ok to use one from the grocery store? Would it be better to use an organic egg from say, Costco? I have yet to try this but I really want to. (The egg thing is holding me back). OMG the things people get told. Any egg is fine but it must be fresh. Like poached eggs, they are better if they are super fresh. Whereas Pavlova needs old eggs. This recipe is fantastic. Just beware you use the light flavour olive oil. I wanted to get away from Miracle Whip, so I bought the “better” jar of olive oil MW, but it still had soybean oil in it plus other yucky ingredients!! I will put aside this recipe to try next time!!! Thanks so much!! Wouldn’t there be a risk of salmonella? I’m one of those who won’t even lick raw cake batter or cookie dough, so I’m kind of with Debbie. I’d love to try it, but am nervous about the egg. Hi Kristen! There’s always a risk of something, but in my non-FDA approved opinion, I’ve made this, eaten it (along with homemade eggnog) and haven’t died or gotten sick yet. 😉 You can always wash the egg first, or try tempering it (barely cooking it in liquid), but I haven’t tried that method. After witnessing a family member sickened with salmonella from an undercooked egg, I am terrified of any raw egg. Is it possible to pasteurize an egg at home and use that egg in this recipe? Possibly Anna, but I haven’t tried this myself so I can’t say for sure. 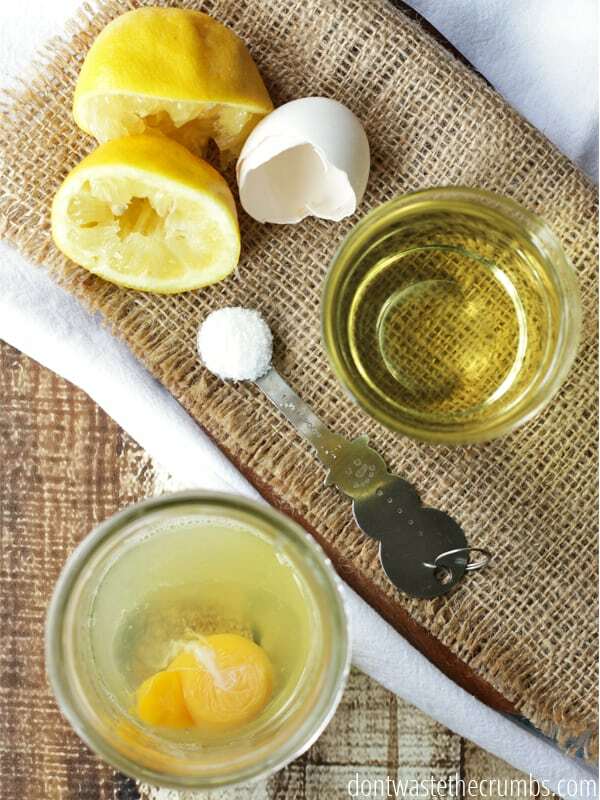 TO PASTEURIZE EGG YOLKS: Gather 3 whisks or forks. 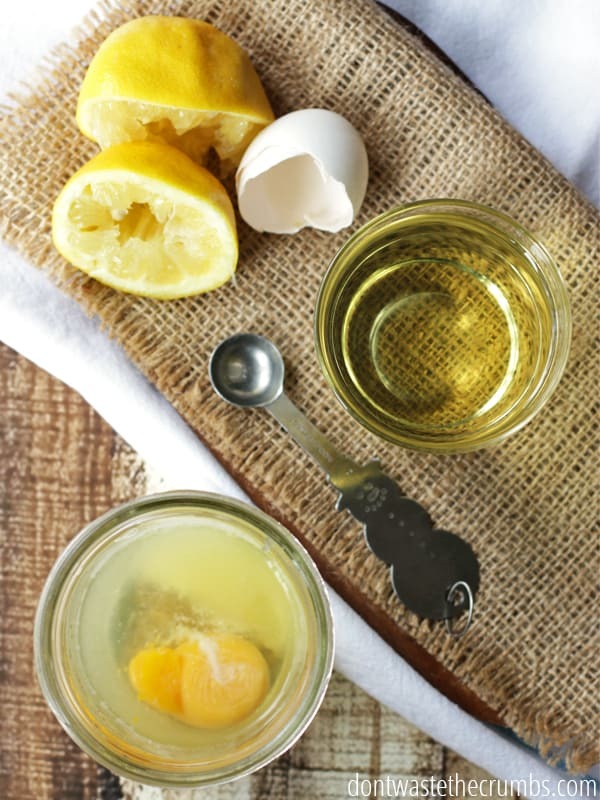 Place the egg yolks in a small bowl and use the first whisk or fork to combine the egg yolks with 1 tablespoon lemon juice. Add 2 tablespoons of water to the egg yolk mixture and whisk again. Seal the bowl with plastic wrap and place in the microwave. Heat the egg mixture on high until the surface begins to rise. Once you see this, cook for 8 more seconds, then immediately remove the bowl and whisk the yolks vigorously with a CLEAN whisk. Re-cover the bowl and immediately return to the microwave and heat on high again until the surface begins to rise. Continue for 8 more seconds, then remove and whisk vigourously with the third CLEAN whisk until the mixture is smooth and creamy. 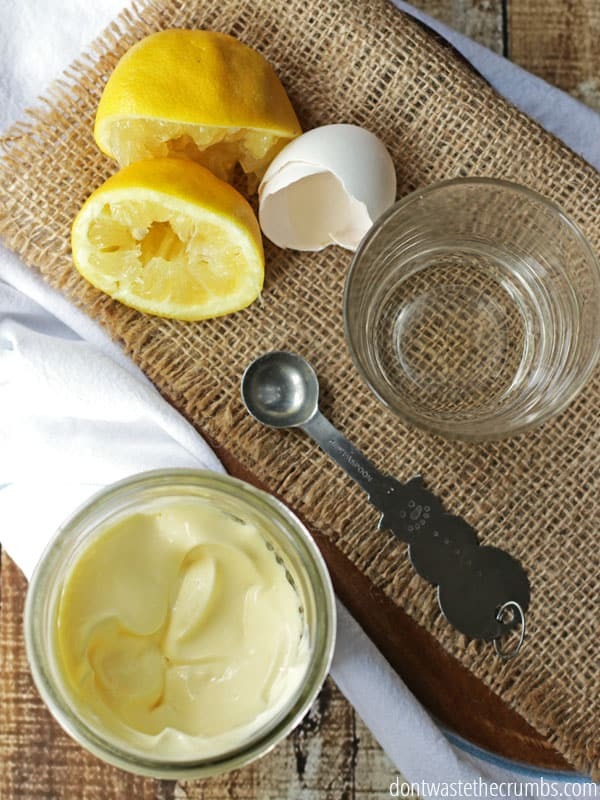 The yolks are now safe to use in mayonnaise or other raw-egg preparations. *If making the mayo with the pasturized egg yolks, use only 1 cup of oil – they cannot absorb as much oil as the unpasteurized yolks.*. The above instructions for pasteurizing eggs yolks at home was taken from a recipe for mayo which called for 1 1/2 C. of oil. For Tiffany’s recipe, I would guess that you would need to lower the oil by about 1/4 volume, but I’m not sure. Everything that I have read says the salmonella is on the outside of the egg, not the inside. This iften spreads through cross contamination. 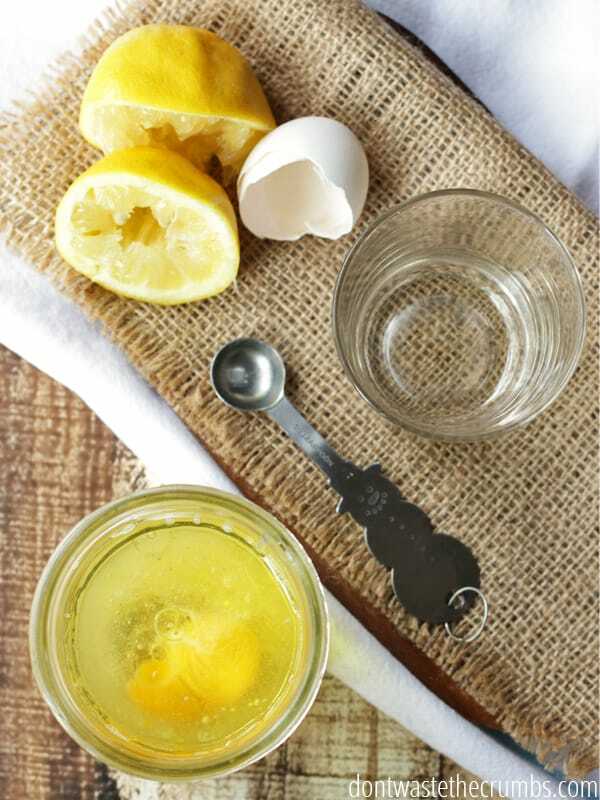 Many recipes that use a raw egg also contain an acid or alcohol which would kill most if not all the salmonella that might come from a contaminated piece of shell. Just be careful and wash the eggs or anysurface they contact before and after using them. Oh, that is so enlightening! Thank you! Hence using very fresh eggs. pasteurized in the shell eggs. This was the one thing I wasn’t sure about as raw eggs gross me out. I use farm fresh eggs and wash the shell before using. I think I read the salmonella is on the shell. Anyway I’ve been making this recipe for mayo for years now and haven’t gotten sick even once. I think putting whey in it helps innoculate it with the good bacteria which keeps the bad away. 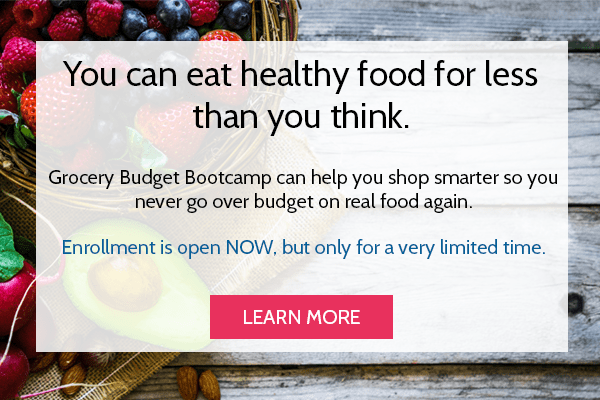 Ultimately you are in charge of your own health so you have to decide what’s best for you. IMO I wouldn’t make this with eggs from the store. THANKS for the tip on using the light olive oil. I made a very similar recipe before with the EVOO… ew! Left a nasty aftertaste in our food, and I was afraid to spend the ingredients on giving it another try. Will do the next time I need mayo. And THANKS also for the tip on lacto-fermented mayo– sweet! Another addition to my arsenal of fermented condiments! 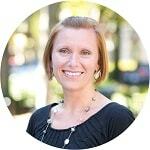 Hi Tiffany- thanks so much for your blog. I have made your homemade mayo a couple of times and it has made life tolerable for me. Recently I was diagnosed with pancreatitis. Told have to eat low fat. Could not tolerate even a skiff of mayo. But MCT oil is approved for pancreatitis since much more easily digested. I can still have my bulletproof coffee with this oil. And now I can have mayo and blue cheese dressing again! Many many thanks❣️I give this recipe 5 stars. Unfortunately the rate this recipe section would not work for me- kept switching from 1-2 stars. Definitely 5stars! Thank you so much Lynn for the rating, and for sharing that you can make this using MCT oil. So glad you can enjoy mayo again! The recipe I use is close to yours but I add my egg first then 1 T lemon juice, 1 tsp vinegar, 1 tsp dry mustard, 1/4 tsp salt, 1/8 tsp white pepper, and garlic powder then add 1 cup oil ( I use 1/2 sunflower oil 1/2 grapeseed oil). Works perfect every time. We don’t like it until it has been chilled so I try to make it in the am for lunch. Thanks for explaining the how and why of this. I had seen a recipe for this before and had done it successfully MOST of the time. I will stick to your layers so it will succeed all of the time. I use Olive oil NOT extra virgin, not light. Just olive oil (surprisingly hard to find at times…) It is tasteless fyi. Take another egg, whisk it well in a bowl. Add 1 Tbsp of broken mayo. Whisk until combined. Add another Tbsp and whisk away. Do this until you have added and thoroughly integrated mayo/egg about 8 times. Then grab your immersion blender and add a few Tbsp of broken to now “unbroken” and turn on blender. Once integrated, add the rest. Should be fine. MAY be a little watery, less thick. I have done this save a few times. Read up on it from Jacques Pepin. 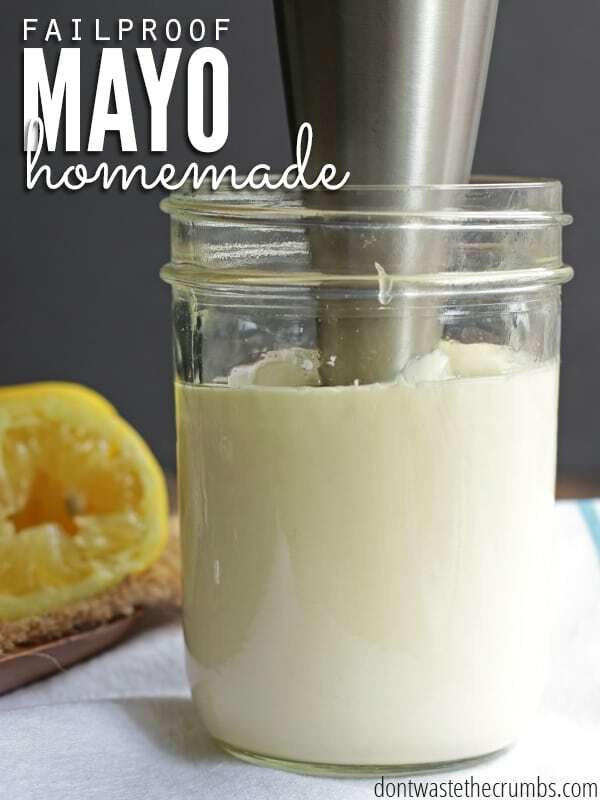 Alexandra, this is a really late response, and you may have already come across other alternatives to rescuing a “broken” mayo, but if not, you may also use 1 TBSP prepared mustard, and whisk in until mixture is thick and creamy. Works like a charm, and no need for an additional yolk. This tip is courtesy of the late Julia Child in her recipe for mayo. Although she created mayo via using a hand whisk, I am all for the efficiency and speed of the stick blender, electric whisk, or mini food processor. Do you have a favorite brand light olive oil? I noticed Costco has avocado oil now but I’m guessing the olive oil taste would be more neutral? I’ve had some expensive flops in the past (macadamia oil) and I think the key for pleasing my picky family would be finding an oil that has a neutral taste, so this looks really promising! Hi, Lisa…any neutral,mild-flavored oil (refined oil) will do. I love using a 50/50 blend sometimes, say, pure olive oil and avocado oil. Yay! I finally made this and although I eat raw cookie dough whenever I bake cookies this just seems more risky. Anyway, I had success on my first try but it sure tastes lemony. I guess I got too good as juicing since my lemon tree went crazy this year. Next time I will use a smaller lemon. I’m so glad I tried this! Wonderful news Debbie!! That pungent lemon flavor will dissipate as time goes on, so taste it this week and see how you like it – then adjust for next week. Congrats on success!! I just tried this yesterday with the light olive oil. It worked perfect! I was worried for a moment when I realised I put the salt in after the lemon juice, but as soon as I started blending….I’m in mayo heaven! I haven’t been able to have mayo for almost a year now due to my soy and canola allergies. You’ve saved my burgers! I tried this recipe a couple days ago and was excited at how perfectly it worked. There is one thing I will never do again, though. That is make mayo with coconut oil. I didn’t have any light olive oil, so I used what I had. It really did work great and hubby loved it. Success! Until I pulled it out of the fridge two days later to use for the first time. That’s when I learned that cold coconut oil is very hard – even when emulsified. With a little extra effort, it’s still usable and I definitely learned something. One of my more amusing kitchen fails. Thank you for the recipe. I look forward to trying it with another oil in the future. LOL, I think those who have used coconut oil successfully used another oil as well due to the hardening factor. I haven’t tried it myself, otherwise I would have shared a tip. 🙂 Glad the recipe worked though and that you’ve found a way to still use the mayo! I also wonder about a regular blender or food processor, I’ve used the food processor with the drizzle method successfully, but boy that takes long and your arms get tired! I don’t’ have an immersion blender and don’t really need to get more kitchen equipment to store. Brenda & Melanie – I bet a both would work, as that’s the most commonly used method with drizzling as Melanie mentioned, but I have not tried using either in making mayo myself. If you try though (or if I do), please update and let us know how it goes! Yes! Just dump everything in and turn it on. I am sooooo excited. Really easy and yum! Glad you liked this Stephanie! I’ve used this recipe twice now. The first time I used a regular blender, and it worked perfectly fine and easy. I do have an immersion blender now though, and I really like just being able to make it right in the jar I’m going to keep it in, and not worry about trying to get as much of it as I can out of the bottom of my big blender. Much less wasteful. I’ve always wanted to make mayonnaise, but was afraid of it. I made your recipe this morning and it’s wonderful …. and SO easy!!! I added 1 large clove of garlic on top of the egg in the jar. So yummy! Yum! That sounds delish Sharon, and so glad you liked it!! How long does this mayo last ? Week? Month? Alone it’ll last about a week Shae. If you add the whey, you’re good for 6 months! I am allergic to Whey, is there a replacement? Are you allergic to non-dairy whey Mary? 1. We substitute apple cider vinegar for the lemon juice (I like the taste). And I’m sure I read somewhere that if you use ACV and leave the mayo out of the fridge for half an hour after making it, the ACV pasteurises the egg… to be honest, we started this in France and a French medic had no issues with children eating raw egg after 1yr, so I’m feeling easy with raw egg, as long as our immune systems are in shape. 2. I think the stick blender and the size of jar might be important. My mother uses my recipe and had great success until she changed her jar to one that was slightly wider. Disaster! Thin mayonnaise! We fixed it with another egg. But as this has happened a few times, our conclusion is that the narrow jar is key to keeping things thick. 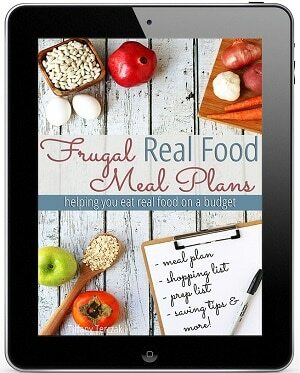 Great tips Shona – thank you for sharing!! Tiffany, I just tried this method. All I can say is, “WOW!” I have been making mayonnaise for years, but always dislike the clean up of the blender jar and blade. THIS method avoids the “nasty clean up”. Thank you for sharing this here. God bless! Which brand of immersion blender do you use? I broke mine last fall. I need to get a new one. I use this one Elizabeth: http://amzn.to/1QS55Ya I like that it comes with a mini-food processor, so I don’t have to lug out the super heavy one (that I don’t really use, lol). I’ve made this twice now, and it’s worked like a charm both times. I’d previously tried another “recipe” using this method, and the mayo came out watery. I can’t really figure out what the difference is, unless it’s just that rest time. I usually add in some Dijon mustard and a splash of white wine vinegar, and this time I added in some whey and let it sit on the counter for a bit to ferment. The whey added a nice tang. Thanks for posting this! What all do you use your immersion blender for? I’d like to invest in one, but would like to know of one that will hold up to regular usage. I have to comment again on this recipe and how thankful I am that I found this information. I have made this recipe at least a dozen times now and it has NEVER failed for me. This is truly the easiest, quickest, best recipe for homemade mayo that I have found. 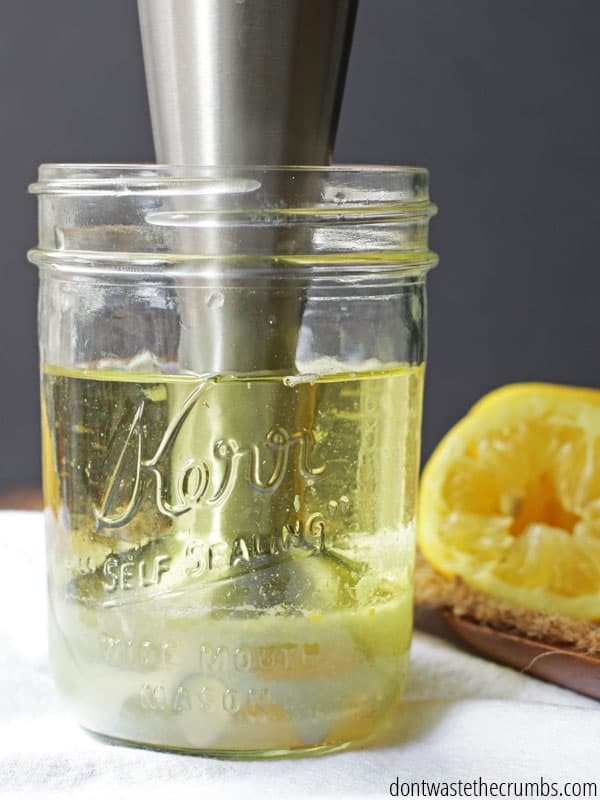 I follow this recipe exactly the only change I make is I use 1 Tablespoon lemon juice and replace the other 1 Tablespoon of lemon juice with apple cider vinegar. I add whey to mine and let it set out for several house to lactoferment so the mayo lasts a long time. It is great that I don’t have to go to the grocery store to buy mayo since this one is so easy to make. Thanks for sharing a keeper recipe. I had tried many other homemade mayo recipes before this one and they worked sometimes and other times didn’t. This is the only one that has ALL the time for me. If you haven’t had the courage to make homemade mayo before please try this recipe. Oh wow Janette! What a glowing review! Thank you so much for taking the time to share with me and fellow readers! I might have to try the ACV sub next time – does it lend a hint of sweet to the mayo? So I just horribly failed my first attempt at homemade mayo. I did not start with this recipe since I just stumbled upon it while trying to figure out why mine tastes so awful. Now I know not to use extra virgin olive oil but I don’t have an immersion blender. Can I have good results with a magic bullet or with a standard electric hand mixer? Hi, i am in an asean country where olive oil is so expensive, cost double than buying the groceries stores mayo itself. I wonder if I change from light olive oil to sunflower oil, will it still taste nice as it is with olive oil? I’ve only tried this recipe with the oils mentioned above Lina, and I haven’t personally tried sunflower oil so I’m not sure how it tastes. Sorry I’m not more help! Yes, sunflower oil will work. Sorry, I posted my last comment too soon. Sunflower oil is very neutral and works great. Making this with ACV, sunflower oil, and a clove of garlic is about the closest I have ever come at home to what my husband expects mayo to taste like! Could I used Grapeseed oil? Grapeseed oil is a polyunsaturated fat Sara, and in general, should be avoided. Wow what a great recipe, I have just tried it and it worked perfectly. Thank you!!! I am intolerant to the protein in Milk and can’t use whey, will substituting apple cider vinegar for the lemon juice really make it last longer instead like one comment suggested? I also am intolerant to the protein in the white of a chicken egg and have to use duck eggs to substitute. Since I don’t have a problem with the chicken yolks could I just use two yolks instead of a whole egg. Sometimes the flavor of duck eggs is a little strong for something like mayo. I don’t know for sure about subbing ACV for whey for the lacto-fermentation part Susan. In fermentation articles I’ve read, you need a live active culture to achieve the same result. Raw, unpastuerized ACV might work, but I’ve also read the juice from sauerkraut or kombucha does the trick. Yes! Just double up on the yokes! It should work great! To make homemade garlic lemon aioli, just add a little extra lemon juice, minced garlic, and Dijon mustard, increase your oil a bit and -Ta-Da- amazing aioli for crab cakes, salmon patties, hoagies etc. Thanks very much for this info, no more disasters. Hey, Just made this recipe yesterday, and I just wanted to let you know that the “recipe box” says first: First, lemon juice. Second, salt. Third, egg. Finally, light olive oil, but your instruction says first, lemon juice, second, egg, third, salt finally oil. Sorry about that Louise! I’ll fix that right now! I am still making this recipe as it is fail proof like it says. Today I was in a hurry and forgot to add the egg until I had already put in half of the oil. I added the egg and then the rest of the oil. The egg seemed to sink to the bottom of the jar so I blended it all together and it turned out great. This is the creamiest, thickest mayo. To those of you who have wanted to make mayo but have been discouraged with other recipes that failed please give this recipe a try. I am convinced the critical part to this recipe is keeping the stick blender in the bottom of the jar until the mayo has formed and then slowly lifting the blender up to blend in the rest of the mayo. I have put in salt before the wet ingredients and it still turns out for me. This is a keeper recipe. Thanks so much for sharing this one. I was so disappointed wasting ingredients with other mayo recipes and now I have success every time with this recipe. Wow! Thank you for leaving such a rave review Janette! I so greatly appreciate it, and I’m even happier your mayo turned out perfect despite the egg being added later!! I tried this recipe because I have a ton of whey to use, but I’m not seeing in the instructions when to incorporate it? It did work, so I’m very happy about that. So easy! Hey Sheryl! Check under the last section of the post. 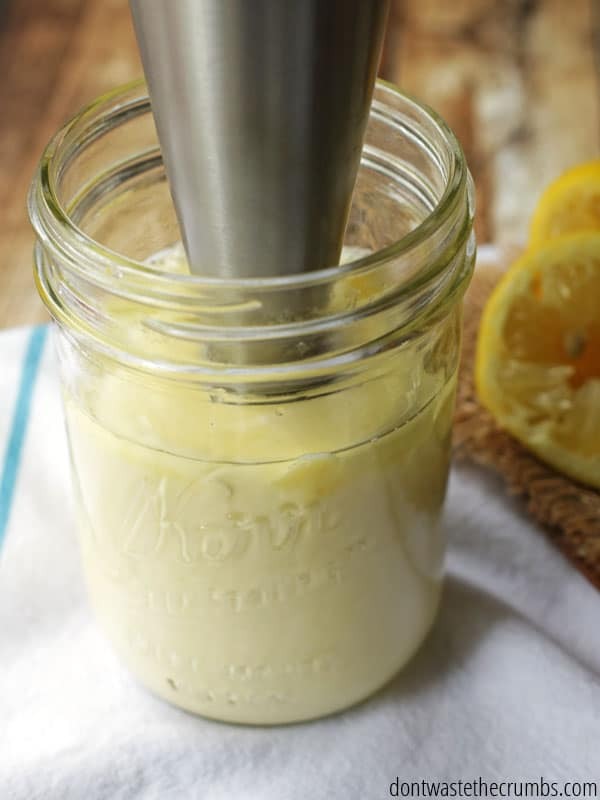 Tiffany shares how to lacto-ferment your mayo using whey. It will keep your mayo fresh longer. Oh, I see it now! Thank you so much. It says to add 1 tablespoon whey to the mayo and cover with lid and sit on counter for around 6 hours, then refrigerate. It’s under the heading how to make mayo last. Why do you specify not safflower oil? Also, do you or any of your readers know why my mayo starts to smell not as nice as when fresh a couple weeks after making it with kombucha? I’ve made it twice and have had the same problem, so I’ve had to throw it out for fear it has turned. I haven’t tasted it. I use a store-bought bottle of unpasteurized kombucha. Since I’m using so little at a time, I’ve been stopping it with a wine stopper and keeping in the fridge. Does it die? Could it be that I don’t have any more live cultures? Hi. I am not sure if I have the right answer for you but I use kombucha vinegar which is kombucha that has fermented for many months and turned into vinegar. My guess is using kombucha won’t work because it isn’t at that vinegar stage where all the sugar is turned to vinegar. Not sure if that answer will make sense to you or not. You can try making it with apple cider vinegar in place of the kombucha and see how it turns out. Also do you use whey to lactoferment it so it lasts longer? I lactoferment mine and haven’t had it go bad after many weeks. The only problem I have had is if my mayo gets pushed back into my refrigerator and it freezes it changes the texture and separates. Hope this info helps you. I use the kombucha in place of whey to ferment because I am lactose intolerant. I’ve read other recipes that use the kombucha live cultures to do the same job. I haven’t figured out from online research if kombucha that starts to go vinegary is only in flavor, or if the cultures are dying/diminishing as well. Probably, right? You gotta give them something to eat and I haven’t graduated to that level yet! From my experience with kombucha I don’t think the cultures die out. We had a batch of kombucha vinegar that I left out in a bottle on the counter because I didn’t have room in my refrigerator. After several weeks it started growing it’s own scoby right in the jar so it must be still alive to do that. I don’t know about the storebought kind. We make ours from a scoby a friend gave to us. I wish I could be of more help. I really like this mayo recipe and use it all the time. I’m sorry you are lactose intolerant. You could probably use whey from non-dairy yogurt as long as it has active cultures. Amazing! The best mayo I have ever eaten. I want to play with some different flavor combinations but LOVE it just as the recipe is written. Super simple, easy cleanup and unbelievably yummy! Thank you! I will never buy store bought Miracle Whip again! Thanks for the rave reviews Kyris! You like it for all the same reasons I do, and to beat out Miracle Whip? Such an honor! I don’t have an emersion blender, what else could I use? Maybe a blender? I haven’t tried it, but I’ve heard others being able to make mayo in blenders before. I have made mayo using a stand mixer but you have to drizzle oil in very SLOWLY or it won’t make correctly. If the recipe doesn’t turn out don’t blame the recipe. The stick blender is key to having quick, failproof mayo for this recipe. Unfortunately failed for me, it stayed liquid. My jar was a tad wider than on the picture here, maybe that was a problem? Hi Charles! The width of the jar shouldn’t matter to the point of this not working. Did you follow the recipe exactly as written? No substitutions or omissions? Yes, I followed it exactly. Tried it again just now, it failed again in the same way 🙁 It mixes but just stays runny, it does not get thick. I am thinking the size of container might have been the problem. You should use a container that is taller and not as wide. I’m so sorry the recipe didn’t work. I know how frustrating that can be. Yes, a wider jar almost always made mine fail until I figured it out. It allows too much oil in with the egg, too quickly. It will start to emulsify and then it breaks and becomes watery after about 8-10 seconds. Very expensive and disappointing, so you might want to add the narrow jar tip to the instructions. It works almost every time in a narrow jar like you have in your photos. I re-purpose Smucker’s Organic Peanut Butter jars, they have a nice wide opening for my immersion blender and work great for salad dressings and mayonnaise. I’ve made this recipe twice now, with great success. The first time I followed the recipe exactly, using light olive oil and the juice of one lemon. It was good, but very lemony. Maybe my lemon was too big, maybe I should have only measured out the 2T of lemon juice. I see some comments about using only 1T of lemon juice. I ended up using most of that batch for a baked salmon recipe that calls for mayo, and it was great. This time around, I used sesame oil and apple cider vinegar, and I just love it! That’s definitely going to be my regular combination from now on. I make my own yogurt and cheese, so the lacto-fermentation is a natural for me with plenty of whey on hand. 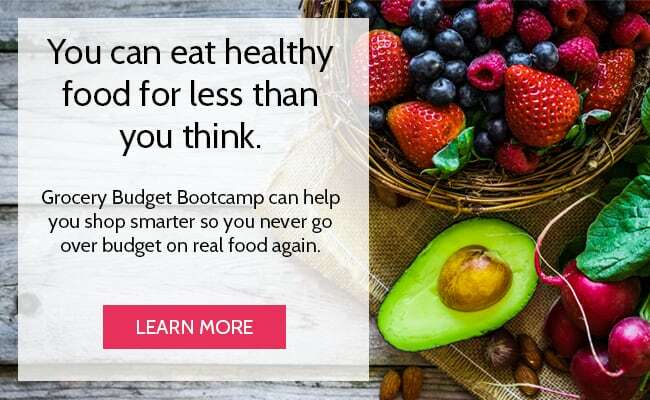 It not only makes it last longer, I think it really improves the flavor, and makes it a healthy pro-biotic food instead of something you should feel guilty about eating – like the processed mayo you buy in the store. I will definitely be keeping this recipe around. Absolutely amazing! I love homemade mayo but I have always followed the mandate of having the egg and other ingredients at room temperature, etc. Even when following the “rules”, every now and then the recipe would “break” and I end up with “soup”, not mayo. Sometimes the “fixes” for a broken mayo will work, but not always. Your recipe is so quick and easy and best of all, it works! Thank you so much! Just made another jar of this amazing mayo, which is probably the 3rd or 4th time since my first post. and it is still working perfectly! I’ve been using a cleaned, empty Smucker’s natural peanut butter jar and it seems to be the perfect size. I also love the fact that I have a cover handy when the mayo is done. When I tried making mayo in the past with the plastic beaker that came with my immersion blender, I still had to scoopit out and then find a suitable container. I used ACV this time but did not leave it out for 12 hours. Is it too late for that since I made the mayo 24 hours ago? I will echo the praises of this recipe! It is so easy and tastes great! I am wondering if you’ve ever tried doubling it? I feel like the one batch doesn’t last long at all- we use almost all of it for a huge batch of chicken salad for our family of 6! I don’t want to make a new batch as often. Thanks! Thanks so much Katherine! I haven’t tried doubling, as we won’t go through it that quick. It’s worth a shot OR make two batches at the same time in different jars, while you’ve got the ingredients out already. Just measure egg glass one, measure egg glass two…etc., blend one, blend two, done! We always double this recipe when we make it. It works just the same without any problems. We use a wide mouth mason jar to make it. One double batch might last a week in our house. I have made this recipe so many times I know it by heart. I don’t worry about which order to put ingredients in but make sure oil is last. This recipe has never failed and is the creamiest, thick mayo! If you’ve never made mayo before please give this recipe a try. I believe the key to this being never fail is using a stick blender in a tall jar that is more narrow than wide. Can someone help me out? I’ve made this twice and with Canola oil NOT EVOO cuz I know it turns out bitter if you use EVOO. But the two times I’ve made this and followed the recipe to a T it turns out with a metallic/bitter taste and smell. Anyone else have this problem? Or is it just my tastebuds? The mayo that turns out like it tastes metalic like my immersion blender. Maybe there’s something wrong with it? Idk it’s confusing. I love store bought hellmans mayonnaise and I know it won’t taste the exactly the same but it should be similar. This mayo will taste awful if you use EVOO – that’s why I suggest using extra LIGHT olive oil, not extra VIRGIN. 😉 Try that and your mayo will be delicious! I said I did not use EVOO i used Canola oil. However I think its my blender that’s causing the metallic taste. Have to say I am feeling rather smug about my homemade mayo! I went to the store specifically for the lighter olive oil but forgot lemons. I used Apple Cider Vinegar instead and the recipe worked brilliantly. So much so that I called my mother in law (who lives about a km down the road) to see if she had lemons (she did). Picked up a lemon and made a lemon and garlic aioli based on one of the comments (added a little more lemon juice, clove of garlic and dollop of dijon mustard), and it too worked perfectly. I’m never buying aioli again! To anyone a little apprehensive about trying this mayo recipe, don’t be, it is so easy and tastes fantastic. Love this glowing review Sarah! Thanks for sharing!! Hi, Tiffany…generally, I rush past so many sites without leaving comments, but in finding so many uses for whey (from my foray into homemade Greek yogurt) led me here. Although I had been using the “fast” method for mayo for quite some time (first found it on Serious Eats several years ago ), not many online recipes mention using whey as a lacto-fermentation process to extend the shelf life of may. 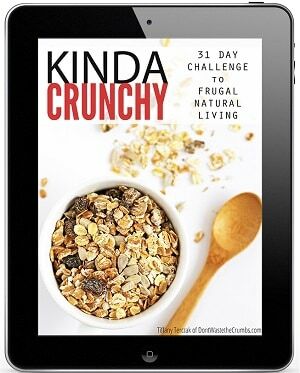 “Whey” to go, and really like how you set up your step-by-step directions and pics! I made this mayo not too long ago and had no problems with it. It came out thick and creamy. (So thick I thought I messed it up! lol) I did change a few things such as using avocado oil and 1 tbsp acv and 1 tbsp lemon. (Heard to many complaints about it being too lemony.) I also plan on trying 1/2 tsp of kosher salt next time for it was too salty to me. And 1 tsp of Dijon mustard, which I thought would help with saltiness but didn’t. (Still eating it though…lol I spread it out thinly, so as to not taste the saltiness.) Main thing I did was follow the instructions on how to add the ingredients and once done, I let it sit for a while, maybe too long in my case, but it came out fine just the same. It was my first time making it and I can’t wait to make it again. So glad this recipe was a winner for you Alicia! I too think that you need to add something about the size of the jar. We tried this tonight is a wide mason jar and it failed miserably 🙁 couldn’t try a second round because we used up the last of the oil on the first try. That’s strange Amy – I use a wide mouth mason jar for this recipe and it works every time. Did you use a wide mouth QUART jar or PINT jar? I use a wide mouth pint jar and it always works. A wide mouth quart jar wouldn’t work because it is larger around and the blender would have too much area around it. I use the wide mouth jars, quart and pint; no problem with either one. I do make sure that when I insert the immersion blender in the jar, that the egg yoke is under it. Don’t know if that would make a difference. I wonder if it depends on where you live? I have a business and I’m on the west coast and make body butters; whips up perfect every time. My daughter wanted to make some but her batches came out runny every time. She lives in the south. Good points Alicia with where you live. Your daughter lives in the south, and I live in the southeast (Georgia) and it’s very humid here. I created this recipe when I lived in central California though, and there’s practically zero humidity there. Alicia that is an interesting point about depending on where you live. I have only used pint wide mouth jars and haven’t had one failure. When I looked at the quart wide mouth it seems to have a wider circumference so I would think that would be a problem with the stick blender. Do you think humidity would be a factor? I live in Colorado where it is drier and not as much humidity. Brilliant! I have been meaning to try making mayo in my thermomix and wanted to use light olive oil. Stubbled across your recipe today when wondering how to use the whey I have left from making yoghurt. This is sooo easy & tastes amazing! I have it sitting on the bench now after mixing they whey in. Can I please ask can the jar be sealed for the laco-fermentation? Thanks so much, I wont be buying mayo again! Would a mason jar with a 4 inch base (64 ounce) be too wide for my immersion blender, which has diameter of 2 1/4 inches? I’ve read that there shouldn’t be too much of a difference in width. Also is the liquid from store-bought (Daisy) sour cream be OK to use for the whey? Any whey should be okay Allen, but the width of the jar concerns me. I just measured my immersion blender and jar – 2 1/4″ and 3″ respectively. You can always try with the 4″ jar and let us know how it turns out. I haven’t tested this myself, but I’ve read that mustard helps to fix broken mayo. Failed:-( Maybe the power is not enough? Mine is 400 watt. You know, I just added another egg and saved it momentarily! I’ll definitely make it again with one egg and will try to figure out what when wrong, because it’s a five star recipe because it’s definitely a no-stress winner. Thank you Tiffany! I don’t think the power wattage would matter. The main thing is to have a jar that is taller ratherthan wider around so there isn’t a lot of area around the blender. Also make sure to keep blender on bottom of jar while mixing until you can see the mayo forming and then slowly lift it up to mix in the rest of the way. I hope you can figure out what went wrong as this is such a quick way to make mayo. Hi Timothy – if extra light olive oil tastes strong, you can try using it in combination with sunflower oil. Hi. I never noticed it before but your recipe says “light” olive oil. I have only used “extra light” olive oil so maybe that is Timothy’s problem? With a little tweaking it can taste just like that H brand or better! Hi, i recently tried this and it came out oily tasting and not so thick. I used refined canola oil. What might I have done wrong? Too fast w/the blender (regarding the thickness)? Thanks! Worked well, although timeline was off for me, I guess I have a gruntier stick blender. Used canola oil, very nice. Ugh! I hate it when everybody else is successful and I am failure. Made the mayo; it turned out liquid. Added an egg yolk. Still liquid. Sad face. I’m so sorry Susan! Did you follow the recipe EXACTLY as written? Do you think I could do this in my nutribullet blender? I’m not sure Susan, but you can give it a shot! Why do you suggest not using safflower oil? I work in a professional kitchen making mayo daily and we use safflower every time. (We also make mayo by hand not with an immersion blender). Just curious as to why its on the do not fly list. It’s comprised almost entirely of omega-6 fatty acids, which in the standard American diet, we already eat plenty of. It would be a better nutritional choice to choose an oil that had omega-3s as well. I used 100% pure olive oil as that was the closest my store had to light olive oil. Your method worked perfectly but, I’m wondering if pure olive oil is not light enough? It taste a bit off. I’m going to let it refrigerate for awhile and taste it again. Can you advise? Would extra light olive oil work better? Hi Jennifer! Yes, pure olive oil is too strong in taste. That’s why I recommend the extra light instead. I don’t know if you can fix the batch with EVOO, other than maybe use it in a marinade or a recipe where you wouldn’t taste the mayo so much. Then next time, use extra light. 🙂 I get mine at Walmart! THANK YOU!!! After 24 hours of intermittent attempts and almost burning out the motor on my hand blender AND my Nutribullet (with the same mix so as not to waste stuff) I finally stumbled upon your page. My epic fail mixture up to this point consisted of two egg yolks, 50-50 mix of virgin olive and sunflower oils, a small squirt of lemon, some apple cider vinegar. After reading your method I threw in the egg white plus some salt and an extra squirt of lemon and BINGO!! Saved the day. I’m too stubborn to have given up. There would have been no supper……It’s a bit runny but I can cope with that! Way to save the mayo Kathryn! So glad I could help! Well, it was great on day one. A little thin right away, but it tightened up after a couple of hours in the fridge. I made great chicken salad using the mayo. Day two, we used it to make ranch dressing, but it was so thick that I had to use a powered whisk to get the ranch dressing right BTW, it tastes great! Day three, the mayo has hardened so much that it has to be broken apart with a fork. I followed your instructions, using coconut oil. Hi Donald! Not to be cheeky, but my instructions didn’t say to use coconut oil, and that’s why the mayo got so hard. Coconut oil gets hard at cooler temperatures and will solidify in the fridge. If you use extra light olive oil, it would be creamy every time. I’m glad you enjoyed the flavor of the ranch dressing! I had a similar experience when I tired it using coconut oil. I found I get the best results if I use 3/4 cup of olive oil (not extra-virgin) and 1/4 cup coconut oil. This way when the coconut oil hardens it is tempered by the olive oil. It never gets too hard to use and instead has a fabulous creamy texture. Thank you so much for this amazing – and unbelievably easy – homemade mayo recipe. I had an epic fail on my first attempt and was so discouraged after wasting perfectly good duck eggs and oil, but I stumbled upon your recipe and noticed that the mayo is made with an Immersion Blender, which I just so happened to get for Christmas! I took it as a sign to give homemade mayo another try, and I am so glad I did. 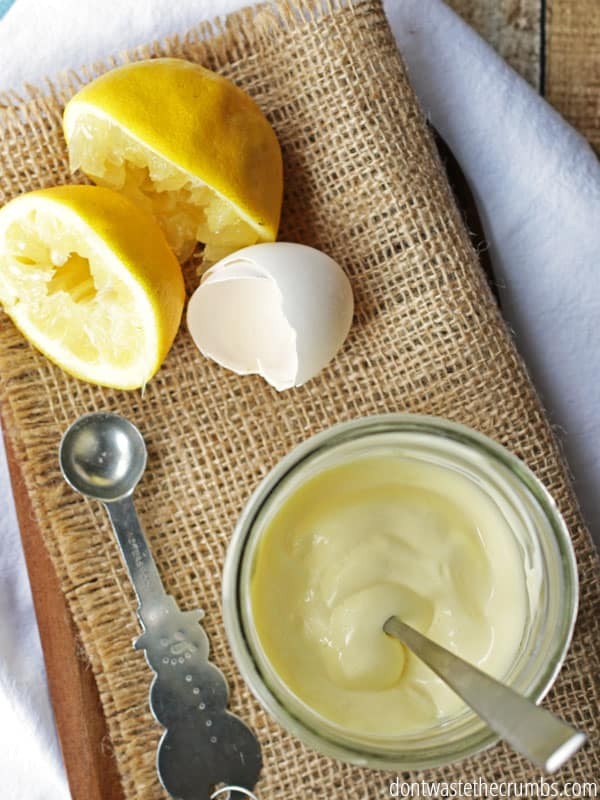 It took longer to juice the lemon by hand then it did for all the ingredients to turn into thick, creamy, wonderful mayonaise. Thank you, thank you, thank you! And anyone who is unsure about trying this recipe, please give it a try, I think you’ll be pleasantly surprised, just like I was. Aw, thank you so much Kathy! I’m so glad you gave this a shot! Feel free to use an online nutrition calculator Brian! THANK YOU! For sharing this super easy way of making mayo. Just made some and it turned out great. I’ve always had trouble before and dreaded using the stand up blender. Using the stick blender in the mason jar is BRILLIANT! You’re so very welcome Andrea!! The absolute best recipe! I love that it comes out nice and thick! My daughter can’t tell the difference between this and store bought! I made it exactly to the recipe the first time. I was so happy. This morning I had to make a quick batch for lunch sandwiches and I only had fresh limes and the only light oil was avocado oil. I added a tsp of some yummy Chardonnay Mustard and a pinch of sugar. 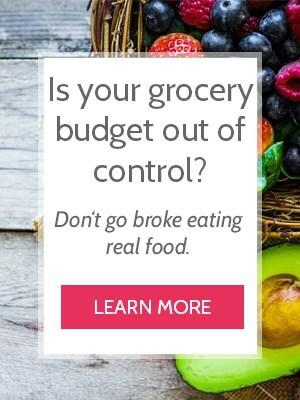 I WILL NOT BUY STORE BOUGHT AGAIN! Next time I will add the whey! Thanks for helping with posting this! i’m lactose intolerant so will have to forego the whey. How long would the mayo last in the fridge without the lacto-fermentation? It should last about a week or so Susan. Use the smell test to gauge! If apple cider vinegar with the mother is used would that help to preserve it? I would think so since it has the beneficial bacteria in it. 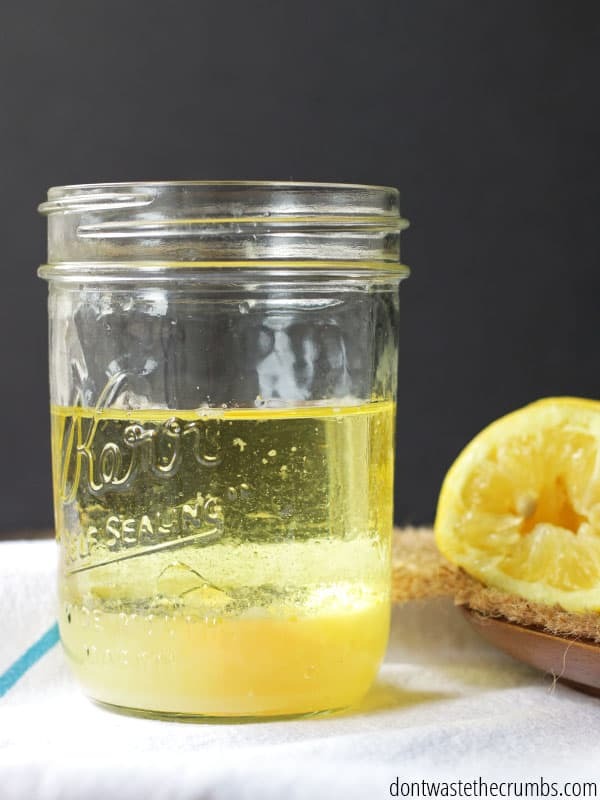 ACV is considered an acid like lemon juice, and will help keep it for a week or so, but you need whey to ferment it, if you want to keep it for a few months. I have been making this mayo for years now and only had one time where it didn’t get thick. This was a couple weeks ago when I forgot to add the salt and the mixture turned out thin. I tried stirring in the salt but it didn’t help much. I ended up using this mayo for salad dressing. I think the salt interacts with the acid somehow so don’t leave the salt out or it might fail for you. This is the easiest, quickest mayo recipe. I highly recommend it. Thanks so much Janette for your rave review! Great recipe, thanks! I will just say ‘don’t’ use cold pressed flax seed oil, the mayo will taste dreadful! I have a question about they whey and shelf life… I make milk kefir regularly for my family and wondered if I added kefir whey how long the shelf life would be. Also, the whey has already been made/fermented sitting out on my counter for 24 hours and because so, would I be able to add it to the mix and put it straight in the fridge or would it still need to sit out on the counter in the mayo mix? I use whey from homemade strained yogurt but using whey from strained kefir should work just the same. I haven’t had a batch of mayo go bad yet and I’ve been making this recipe for years now. I let my mayo set out 4 hours to let the whey ferment the mixture but if you refrigerate it right away I would think the mixture would still last awhile from the whey being in it. I just made the yummiest and creamiest Mayo now. I used Sunflower Oil and Lime as I don’t have lemon juice at home. What I will reduce for next batch is probably the salt. Apart from that this is the best ever. Way better than any store bought Mayo I have ever had. You’re so very welcome Taiwo! I’ve made this recipe with raw egg and just threw in the ingredients and blended. Came out beautifully. Now I have a member of my household who has an autoimmune issue and can’t have raw eggs. I bought organic, pasteurized powdered eggs. Has anyone ever tried this recipe with powdered eggs? Thanks! I have stalked several “jar-blender” mayonnaise recipes for awhile but never tried one as I read too many comments (on other websites) where the recipe failed. Not wanting to waste costly, organic oil for failed mayo I just trudged on with the long, oil drizzle method in the food processor. And sometimes that translated into buying a jar of organic $$$ mayo instead of buckling down and making it at home. I read your recipe about 8 times (lol, seriously!) then took the plunge. Easy, easy, fast, and easy! And so delicious. Is going to work in a regular blender? I don’t have one like yours. I tried other recipes and it didn’t work. It may or may not work Esther. I’ve only used an immersion blender so I personally can’t say for sure, but feel free to read the comments to see if someone else has tried it! That’s so strange Susan! I’ve never had that issue with the mayo. Could it be an ingredient that’s making the weird taste the next day? I’d say for those whose mayo is coming out too runny, start with a little less oil maybe? Not sure but 1st time worked perfect for me; last time was a bit runny, but I was using a slightly smaller-than-standard egg from a friend’s flock, so I probably should have reduced the oil or lemon a tad to compensate. I also used 1/2 light olive, 1/2 avocado oil, and the flavor is nice and neutral, a bit lemony. I have an idea that may solve some unsuccessful problems. I live in AZ and the water is terribly hard. We have to add jet dry and a booster to our dishwasher so the dishes don’t spot severely. I’ve noticed if I use a clean bowl right out of the dishwasher, dairy product recipes I make are soupy. For instance, whipping cream or cream cheese dips. So I always rewash my mixing bowls by hand, with plain water to ensure the additives I put in the dishwasher are completely rinsed off the mixing bowls. It works! No more soupy hand made recipes!